Since 1989, DR strings has been committed to bringing you the beauty of handmade strings for guitars, basses, and other stringed instruments. Many guitar players notice a difference between the sound of handmade strings and machine-made strings, and to some, handmade strings are the clear winner. In addition, DR strings are an American-made product from start to finish. These high-quality VTE-10/52 Veritas Big & Heavy electric guitar strings range from 0.010" to 0.052" in diameter and feature round cores for a sweeter response. Their Quantum Nickel wrap wire offers enhanced magnetic qualities, which results in a more powerful sound compared to ordinary NPS 8% nickel-plated wire. 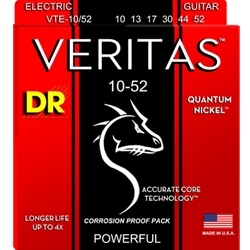 Plus, all Veritas strings employ Accurate Core Technology (ACT) to reinforce the wire and fill in any imperfections, resulting in louder, brighter, longer-lasting guitar strings.